I often get bits of leftover yarns, usually at least some leftover singles from a plying mission, and sometimes I even make myself a yarn to play with too! This iPad sleeve is made from some bulky singles yarn (merino Bamboo blend)which I had dyed in pretty mermaid colours, and some lovely natural coloured dark espresso brown Polwarth which I had autowrapped with gold thread. I also had an iPad that needed a nice cosy sleeve so I could put it in my bag without worrying about scratches..
Its no secret, I am not the worlds greatest knitter, in fact I am potentially the perfect contender for the coveted title of ‘Most Likely to Tangle Herself in Her Own Knitting’ award. But still, I valiantly dusted off my needles and and managed to cast on. 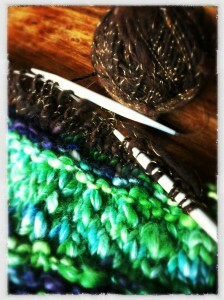 In fact I think I cast on about 40 stitches, in this nice bulky yarn. I used circular needles because I always do regardless of the project, because otherwise I always drop the needle out of the stitches and have to pick them all up again and inevitably end up with holes. See I told you. When I had gotten to about an inch short of the total length I wanted (phew) I changed to garter stitch, just knitting each row until I was ready to cast off, which I did, at great risk to life and limb, but finally managed to cast off completely without strangling myself in deadly loops of yarn. This is really an easy project – no shaping required and just keep knitting until you get to the length you want! When I was done knitting I just stitched the bottom edges together and up the side to make it into a sleeve. Thats it! I think the beauty of something like this is the simplicity, allowing the yarn to do all the jazzy pzazzy stuff for you, in this case I got some pretty colour changes from my hand dyed yarn and the gold thread in the Polwarth really added some shine. 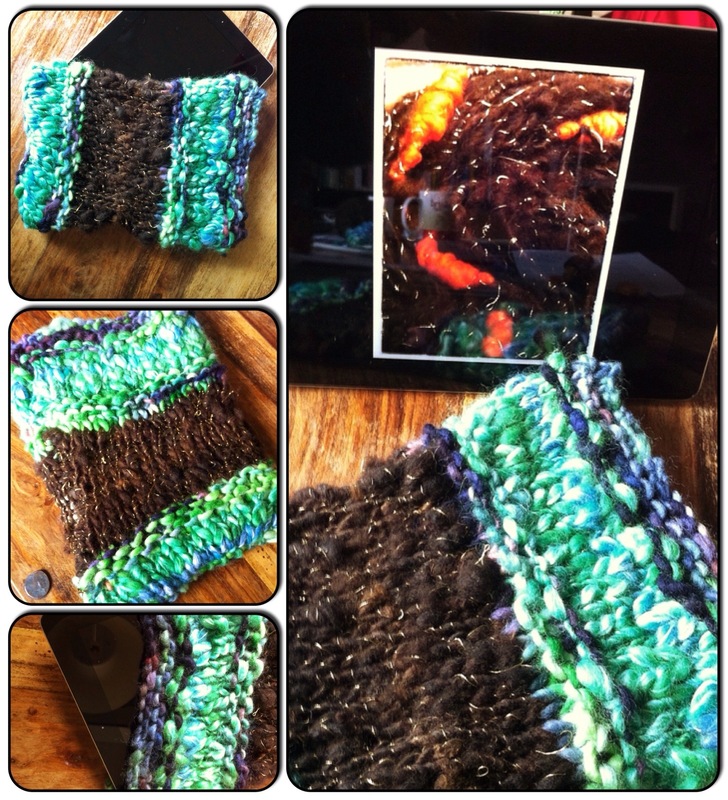 Nice idea for small bits of yarn! 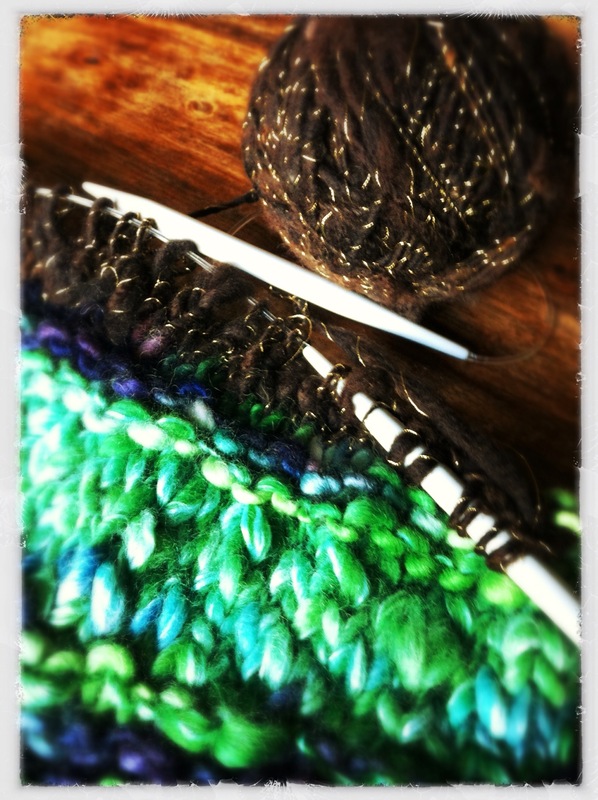 And using art yarn makes it ever so special. Thanks Pam! I like these little projects that take just small amounts of yarn, especially when you’re just using whatever you have rather than buying or spinning something for a project. This way it’s always a surprise result!